Nintendo just revealed a new side-scrolling Wii U adventure for Donkey Kong, which also sees the return of Dixie Kong. 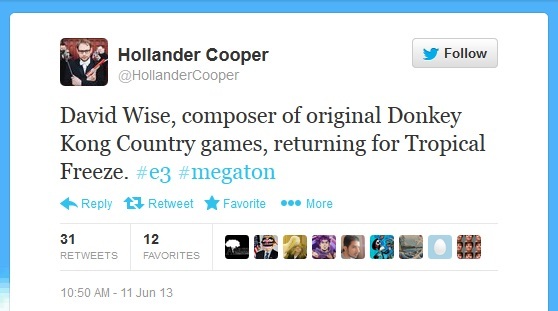 Donkey Kong Country: Tropical Freeze is coming to the Wii U later this year. sure it's still gonna be an excellent platformer, but please don't rush too much out! looks so much better in motion, will be another classic! Help Donkey Kong and his friends save their home and banana hoard from marauding Vikings in the Donkey Kong Country: Tropical Freeze game from Retro Studios. All the challenging ground-pounding, barrel-blasting, side-scrolling mine cart action from the Donkey Kong Country series is back along with a bushel of new game-play elements and features. 1.Dixie Kong is back to join the adventure as a playable character alongside Diddy Kong. Either can buddy up with Donkey Kong, and each character offers a different game-play experience. 2.Explore new dynamic levels that twist, turn and transform in new ways. Plus enjoy spectacular views from the dynamic rotating camera. 3.On their journey to reclaim Donkey Kong Island, Donkey Kong and his friends travel across five islands with a variety of stages that include underwater areas and frozen environments. 4.Enhance Donkey Kong’s exploration and unlock secrets with a variety of new moves, including a “plucking” system to pull items right out of the ground. Mario Kart 8 release date news time. It's been a while since we've checked in on the new Mario Kart, but with the release of Super Mario 3D World and the lackluster reception of the initial game launches on PS4 and Xbox One, people are really flocking to the Wii U - at least it appears that way. That means the console's next big flagship will soon have the spotlight on it. Let's see what we already know. First up: the Mario Kart 8 release date is quite comfortably confirmed for Spring 2014 (April, according to leaks). 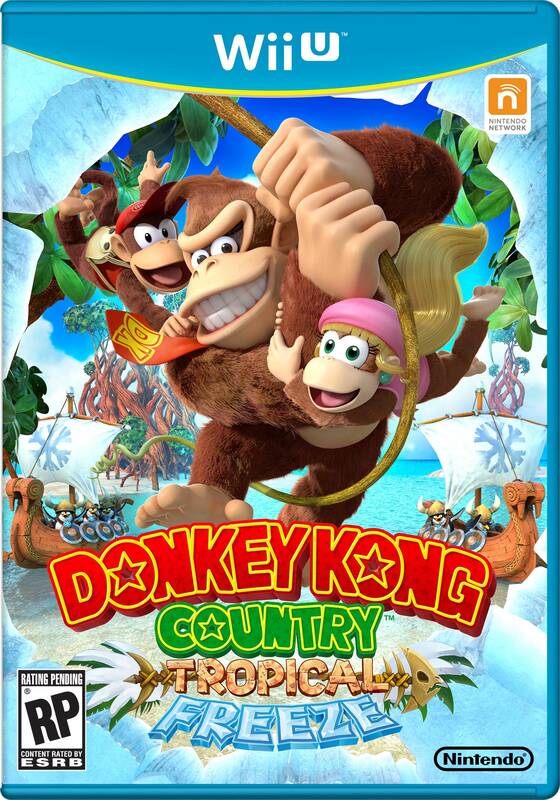 That makes it, along with Donkey Kong Country: Tropical Freeze (set for release on February 5, 2014), the primary release for the first half of next year. Super Smash Bros is the big tentpole for next holiday - assuming it doesn't get delayed for more development time, a pretty likely possibility considering Masahiro Sakurai's obsessive perfectionism. That means there's a lot riding - ha ha - on the Mario Kart 8 release date. Mario Kart Wii was the second best-selling game in the history of the console, right behind the long-time pack-in title, Wii Sports, and three slots ahead of a Mario title (New Super Mario Bros. Wii). Games like Super Mario Galaxy and Super Mario 3D World get more press and are more critically acclaimed, but Mario Kart is the real secret engine of Nintendo. So Wii U needs it. Good thing we're starting to learn more about Mario Kart 8, and the more we know, the better it looks. GamerSyndrome did some actual on-the-ground reporting at the Madrid Game Week conference, of all places, and managed to secure us some new demo footage of Mario Kart 8. Check it out below. The Madrid Game Week show also wrangled up some new information on what we'll get when the Mario Kart 8 release date rolls arond: the game's controls will take two main forms, the new Wii U GamePad controls and a reprise of the Wii version, using Wii Remotes and, indeed, the somehow less gimmicky than it looked like Mario Kart Wheel. Hope you held onto it. The new footage also confirmed a portion of the roster for us, with, thus far, no surprises. We've got Mario, Luigi, Peach, Yoshi, Bowser, Donkey Kong, Toad, Koopa, Daisy, Toadette, Wario and Waluigi. I doubt that's the complete roster; if it were, it would be the smallest since the Nintendo 64 days, and with the increased capacity of the Wii U, that doesn't seem terribly likely. The Mario Kart 8 demo above also shows off more of the new anti-gravity based gameplay, which looks pretty cool, especially with the new graphical upgrade. No really shocking revelations yet - Nintendo will almost definitely wait until after the holidays to start hyping this and Donkey Kong Country - but the game is looking solid. It's something to look forward to, if not something to get excited about yet. After all, Mario Kart 7 for 3DS is the best game in the series so far - yes, I know that's a bold statement - and we have no reason to think Mario Kart 8 won't be even better.